John Legend is known for making hits. His fans all over the world love the way he put his unique voice on a song. A few years Legend started working with Stella Artois. From that point on Stella Artois and John Legend would work on a few collaborations. This month John Legend and Stella Artois debuted the first-ever duet between a musical star on earth and actual stars in the sky. “Under the Stars,” an exclusive holiday single written and performed by Legend, will be gifted to America as a part of the Stella Artois “Give Beautifully” holiday campaign. The duet pays homage to the brand’s name, “Stella,” which directly translates to “star” in Latin. 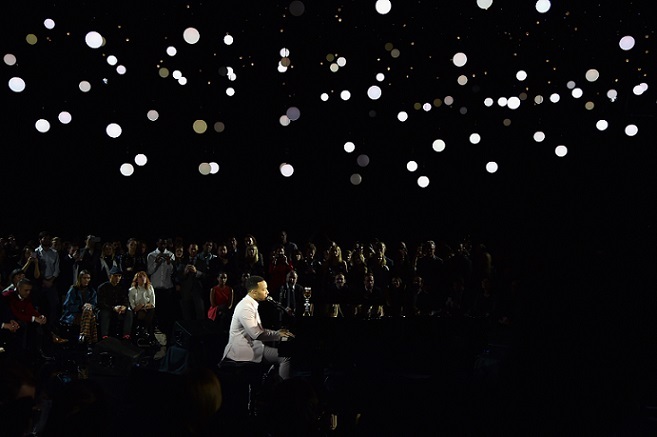 Stella Artois and award-winning artist John Legend today debuted the first-ever duet between a musical star on earth and actual stars in the sky. “Under the Stars,” an exclusive holiday single written and performed by Legend, will be gifted to America as a part of the Stella Artois “Give Beautifully” holiday campaign. Stars are known for illuminating the night sky, but a little-known fact is that stars also make sounds. The frequencies by which a star’s brightness changes can be translated into unique audible tones; from pulsing beats to ethereal vibes to atonal reverberations, each star has a unique sound. “Under the Stars” features the distinct sounds of four different stars in the Universe in the song’s intro, outro and chorus. Stella Artois sought the expertise of astrophysicist Zoltán Kolláth to translate and analyze these unique star sounds. Check out the sights and sounds in the video below. Print article This entry was posted by Art Eddy III on December 17, 2015 at 1:18 pm, and is filed under Entertainment. Follow any responses to this post through RSS 2.0. Both comments and pings are currently closed.